After renders and box shots, FLO TV is officially airing its Personal TV device (or PTV). 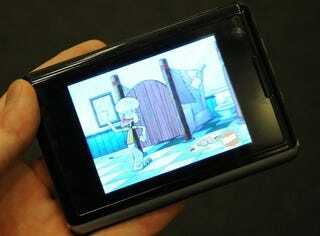 The 3.5-inch player broadcasts live terrestrial digital TV. But $250 along with a $9 monthly subscription fee for just a handheld TV?! The hardware, made by HTC, is pretty run-of-the-mill. The 4.4 x 3.0 x 5.0 inch, 5 ounce device didn't feel too heavy in my hand. And I quite liked channel surfing with a finger on the capacitive touchscreen. My favorite part of the device? It has a kickstand on its back so you can prop it up on a table (none of this having to hang it with a case stuff). The television service on the Qualcomm FLO TV Personal Television runs smoothly (it is the same thing as Verizon's VCAST, etc). And you get a ton of channels, including ESPN, Comedy Central, MTV, NBC, and Nickelodeon. What you cannot do with the PTV is watch live programming on a plane or subway. You also cannot record any of your shows, even though it does have 4GB of on board storage for your music or movies. So yeah, it is a bit of a dead gadget when there is no service around. And while it has a 3.5mm headphone jack, there is no video out. Balls! No chance of hooking this baby up to your monitor or HDTV.